Seminal schlock favourite among fu followers, Wang Yu’s sequel is a zany triumph – the follow up to his handicapped heroics in 1971’s One Armed Boxer. 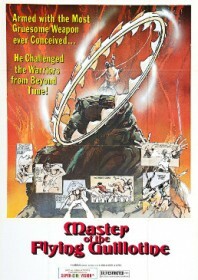 As well as revising his favourite Ming revolutionary, Jimmy Wang Yu borrows the star of the 1974 Shaw Brothers adventure The Flying Guillotine, namely the guillotine itself: an ancient serrated frisbee on a chain which, when aimed accurately, lassos around an opponent’s neck to deliver freshly severed heads in its own carry bag. Kam Kong plays a blind, imperial assassin parading as a monk who learns of the One Armed Boxer’s triumph against his two Tibetan disciples from the first film. All within the same opening sequence, he rushes inside his home to retrieve his trusty flying guillotine, decapitates some passing birdlife, and then sets fire to his own house. Meanwhile, rebel Wang Yu and his new antigovernment students avoid participating in the upcoming Eagle Claw tournament for fear of subterfuge, yet he still decides to turn up to watch the brutal, gladiatorial proceedings. The famed Lau brothers – borrowed from the Shaw studios to work as choreographers – use the tournament to showcase styles from around the globe, albeit mockingly, with the inclusion of an arrogant Muay Thai fighter (Sham Chin-bo), a Japanese kobojutsu master (Lung Fei) and an Indian yoga mystic (Wong Wing-sang). The latter seems to have mastered a neat extendable arm technique which allegedly inspired the Dhalsim character in Capcom’s Street Fighter II video game. The blind monk enlists their opportunistic help in pummelling the disabled boxer, which will certainly take some effort considering that at one point he punches a man through the roof. It’s obviously completely crazy, but Wang Yu’s sincere approach – suggesting a serious attempt to make sense of the madness – only helps to make the whole thing even funnier.